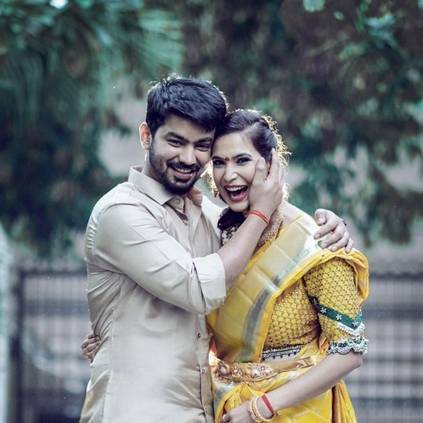 Actor Mahat Raghavendra has acted in a lot of movies like Mankatha, Vantha Rajavathaan Varuven etc., He shot to fame following his stint in the second season of popular reality show - Bigg Boss. He was in a long time relationship with his Prachi Mishra, and the couple are now engaged. Mahat took to his Twitter, as he posted a picture along with Prachi to announce this news. The wedding date hasn't been fixed yet. Prachi Mishra is a former Femina Miss India Earth beauty pageant winner, a model and a business woman. The ceremony saw Mr. Suryanarayana and Ms. Umadevi - Mahat's parents, and Mr. RC Mishra & Ms. Prabha Mishra - Prachi's parents grace the occasion. Mahat is currently working on his first film as a male lead titled Kettavanu Per Edutha Nallavan Da, where he plays the role of a STR fan. We wish the couple the very best for a great future. Vishal And Anisha Alla’s Engagement To Be Held On March 16th In Hyderabad. People looking for online information on Engagement, Mahat, Mahat Raghavendra, Prachi Mishra will find this news story useful.